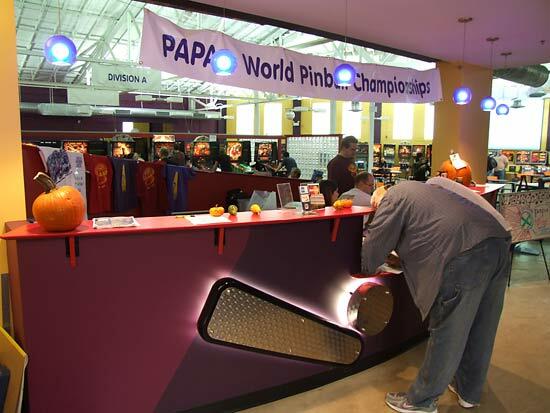 Welcome to our coverage from PAPA 10 - the world championships of pinball. 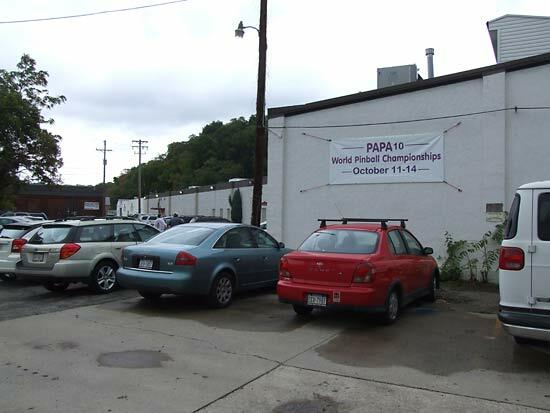 Qualifying began on Thursday at the PAPA facility in Scott Township. 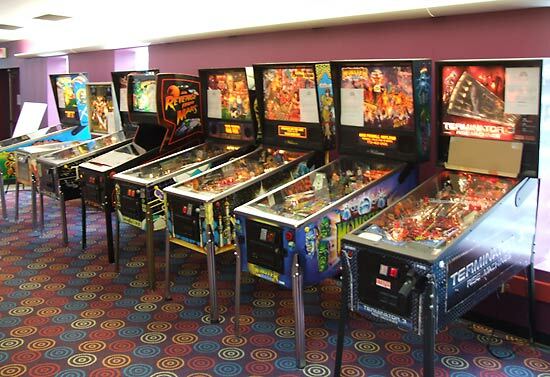 Although it is all based around the tournaments, once you enter the building you'll find there are still plenty of recreational machines to play and on which to practice. Registration could either be done online in advance or at the desk inside the building. 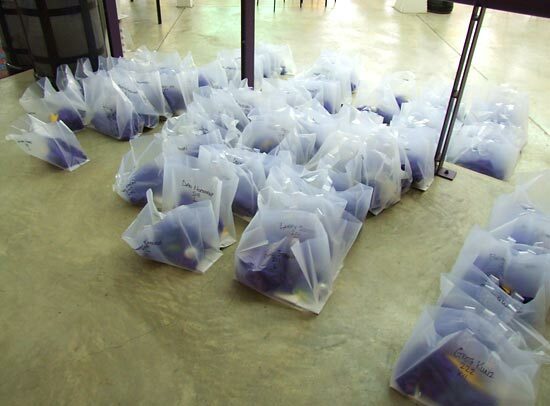 Those who pre-registered found their name already on the list and their badge ready to collect. The name badges were all hand written whether you pre-registered or not but those who pre-registered found their goodie bags with t-shirt and a notepad, pen, deck of cards and squishy ball all branded by PAPA head Kevin Martin's company - Pair Networks. The building is home to an amazing collection of machines. On Thursday there were 322 of them set up for recreational play and a further 51 for use in the various tournaments taking place over the four days. 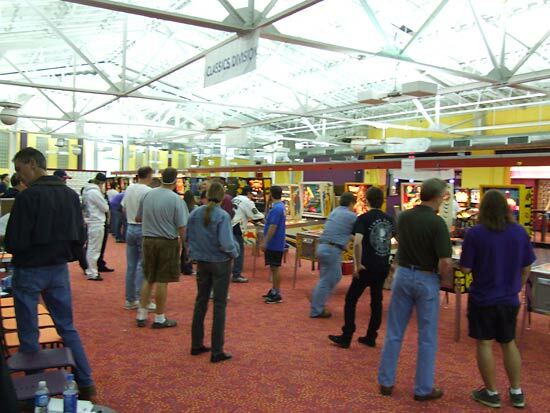 The centre of the main room is where the A, B, C, Classics, Juniors & Seniors tournaments are held on machines arranged in two rows back to back. 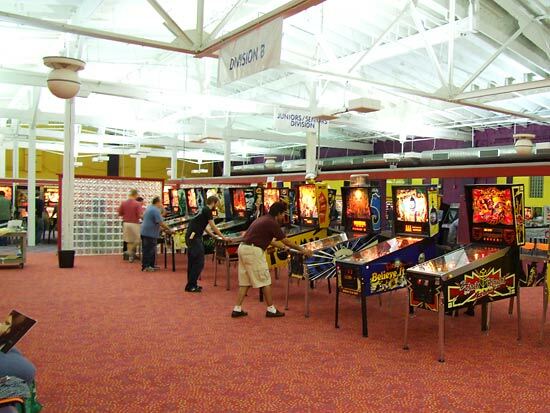 At the left end of the picture above are several rows of machines on which to practice and behind the tournament area is another room full of recreational play machines as you can see below. * indicates machine was not working at the time the list was made on Thursday afternoon. It may have subsequently been repaired. Some of these machines would be swapped around as tournaments ended or completed their qualifying stages. Recreational machines and those not in the main divisions are all set on pay to play, but there is no entry fee to get into the PAPA facility - competitors pay to enter the tournaments instead. Entries to the A Division cost $20, the B division was $15 and the C Division was $10. Multiple entries are not only possible but almost mandatory with some players spending hundreds of dollars trying to qualify. The side tournaments required an entry fee and also the price to play the machine. Money raised from the cash boxes of these tournament machines all went to charity. 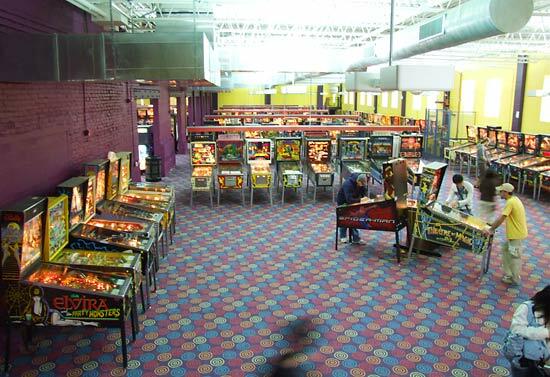 The vast majority of recreational machines were priced at 50 cents per game except a few of the very newest machines such as Spider-Man which were 75 cents and some older games which were only 25 cents. A few also had "for sale" stickers on and were removed or shut down once they were sold. 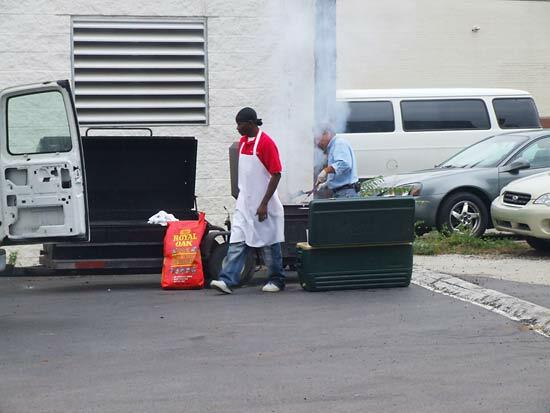 At around 4pm on Thursday afternoon, a delivery van arrived and a barbeque was set up just outside the building. By 5pm, the burgers and hot dogs were ready and served to hungry competitors. This continued each day of the event when the cooked meals were served inside the building along with bread, drinks, condiments and cutlery. But all this, nice as it was, was a sideshow to the main business of the tournaments. Players could choose to compete in one of the three main divisions A, B or C. The A Division was for the real expert players, the B Division was for the slightly less accomplished players while the C Division catered for those not ready for A or B. Once you decided your division you could subsequently move up a division if you found you were playing in the wrong group but you couldn't move down a division, and if you moved up, all your scores in the lower division were wiped. Each division had a marshall who took the players' score sheets and directed competitors to their machines. 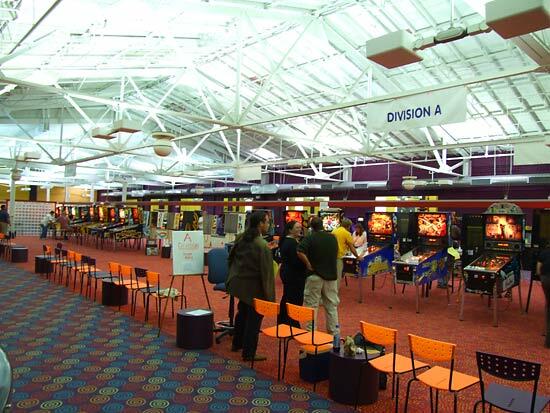 Each entry allowed you to play one game on five machines from the division's pool. Competitors had to choose their five machines before starting play. Although there were waits at the busier time, those waits were never excessive and outside those times a competitor could often walk up and start playing a game almost immediately. After each game, the marshall recorded the score and, if possible, directed the player to the next machine. 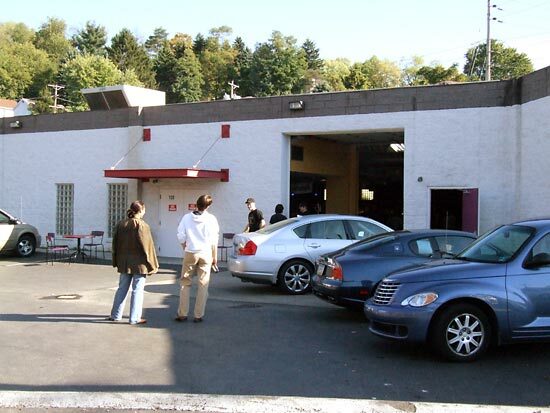 Inevitably, a few machines broke down under the strain but in nearly all cases the delay was only for a few minutes while one of the technicians fixed the fault and the resulting backlog soon cleared. 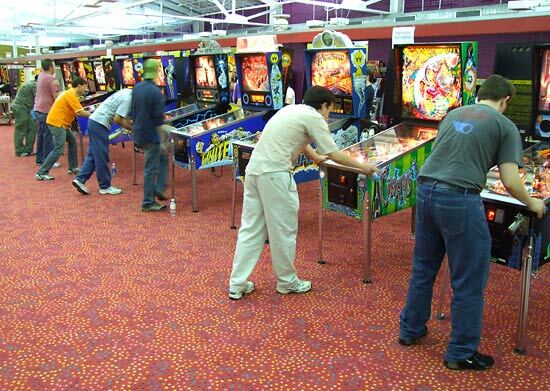 Players scores on their five machines were recorded and ranked against all the other scores on those machines. Ranking points were awarded for each game and the total of the five games was the score for that entry. Scores from different entries could not be combined, so it was possible for subsequent entries to knock down the ranking of earlier entries. Scores and rankings were displayed on a large screen in the seating area. The screen wasn't ideal for a number of reasons. First, the ambient light level sometime made it difficult to read. The location was away from the play area and the entry sales desk and finally, the information layout was not optimised. This led to too much information on the screen, sometimes even flowing off the bottom of the page, something that could have been helped by pressing F11 to make the Firefox browser fill the screen. To help rectify these issues, there were a couple of PCs set up so competitors could find the information from the live standings on the event website and even print them out. For those with their own equipment, a free Wi-Fi network was provided in the hall. Several people were seen writing blogs or updating their websites with a running commentary of events. But let's get back to the tournaments. 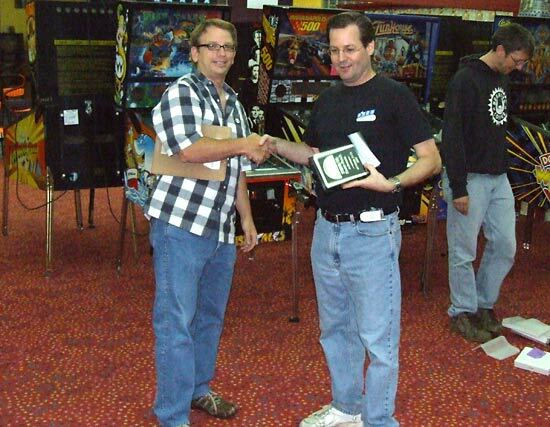 The Classics 1 tournament was the first to be completed. It concluded on Friday after a qualifying round played on Space Invaders, Hot Tip, Target Pool, Firepower, Centigrade 37, Scuba, Silver Ball Mania and Argosy from which the top eight ranked players progressed to the quarter-finals. Those eight were: Josh Sharpe, John Kosmal, Rick Prince, John Miller, Johnny Modica, Keith Elwin, Trent Augenstein and Bowen Kerins. In the quarter-finals Josh Sharpe defeated Johnny Modica on Argosy, John Kosmal defeated Keith Elwin on Space Invaders, Rick Prince defeated Trent Augenstein on Hot Tip and John Miller defeated Bowen Kerins on Scuba. So Josh, John, Rick and John moved on to the semi-finals. 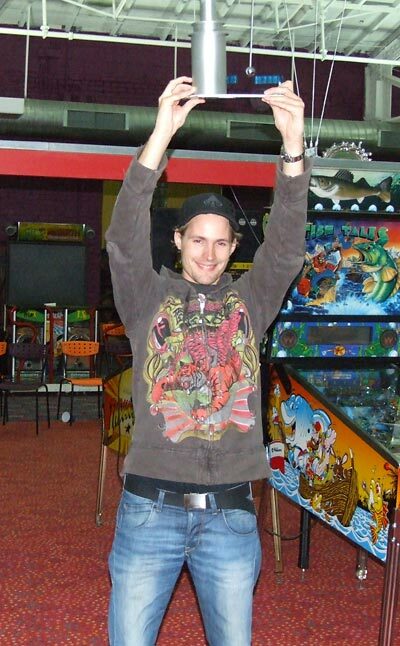 The semi-finals were played on Argosy and Silver Ball Mania. Josh and John Kosmal played the Argosy with Josh coming out the winner. John Miller went up against Rick on Silver Ball Mania with Rick triumphing. 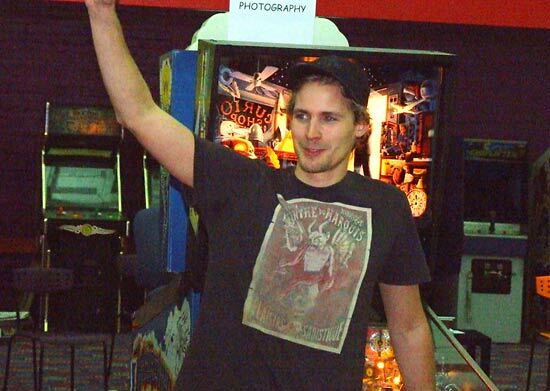 So in the final it was Josh versus Rick on the machine Josh had played in the semis - Argosy. This time though, it was Rick who prevailed to secure first place and the $500 prize. Josh was second with $250 and in the play-off for third between the two Johns, it was John Kosmal who defeated John Miller to pick up the $125 prize over the $50 fourth place award. A second Classics division was held on Saturday but this time a different format was used to match the 4-2-1-0 scoring system in the main A, B & C divisions quarters, semis and finals. These all involve four player games where the player with the highest score earns 4 points, second place earns 2 points and third place 1 point. After all the games on all machines have been played, the total points for each player determines the final places. In the Classics II division there were eight competitors who progressed from the qualifying round to the semi-finals. They were: Bowen Kerins, Cayle George, Keith Elwin, Jim Belsito, Brian Bannon, Neil Shatz, Don Brownback and Johnny Modica. Bowen, Keith, Brian and Don played in the first semi-final on High Speed, Paragon and World Cup. Cayle, Jim, Neil and Johnny played in the second on Dracula, World Cup and Triple Action. From the first semi-final, Keith Elwin progressed to the final as the top points scorer. Bowen Kerins and Jim Belsito tied for the next places but also progressed while the fourth place was also a tie between Johnny Modica and Cayle George who played a tie-break game on Fireball with Johnny securing the win and that fourth slot in the final. In that final, despite a fourth place in the first game on Paragon, Bowen Kerins won the next two on Fireball and World Cup to win with 8 points, picking up the prize of $500. Keith Elwin and Jim Belsito tied for second with 6 points each, but after a tie-breaker on Triple Action it was Jim who ended up second with $250, Keith was third on $125 and Johnny Modica was fourth, picking up $50. In both the Juniors and Seniors divisions the machines used were Surf 'N Safari, Hurricane, Terminator 2, Game Show, Earthshaker, Pirates Of The Caribbean and Embryon. From the Juniors players, the eight qualifiers for the semi-final were: Jacob Prince, Ethan Blonder, James Cooke, Kyle Davis, Brodie Richardson, Justin Ortscheid, Alexis McAndrew and Alex Clark. Jacob won the top qualifier's prize of $50. In the first semi-finals Jacob Prince scored 10 points with two firsts and a second place which got him through to the final. Ethan Blonder did the same in the second semi-final which left Brodie Richardson's 8 points securing the third slot and a tie between Alex Clark and Kyle Davis for the final place which, after a tie-break game on Embryon went to Alex. The final of the Juniors Division was played on Game Show, Surf 'N Safari and Embryon. The first two games were won by Ethan with Jacob second. To create a tie for first place with Ethan, Jacob had to win the final game on Embryon and hope Ethan came fourth. In fact it was Jacob who was fourth, meaning Ethan had won the top prize of $750, Jacob was second - tied on points with Alex but with better results to win $300, knocking him down to third and $150 with Brodie in fourth and $50. In the Seniors Division, the top eight qualifiers from the first round were: Timothy Post, Rick Prince, Ed Hershey, John Reuter, Ron Shuster, Mike Pacak, Alan Gwinner and Joel McDonald who all progressed to the semi-finals. 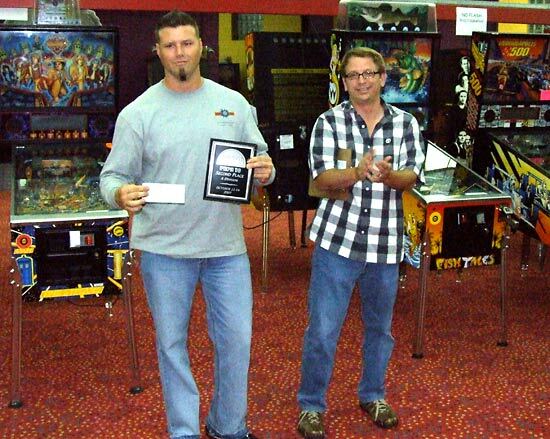 Timothy was the top qualifier and so picked up an immediate $50 prize. In those semi-finals, it was Mark Clark (sub), Joel McDonald, Timothy Post and John Reuter who progressed to the final which was played on the same machines as the Junior Division final but with Embryon first, Game Show second and Surf and Safari last. In the first game, Timothy Post took an early lead by winning on Embryon. 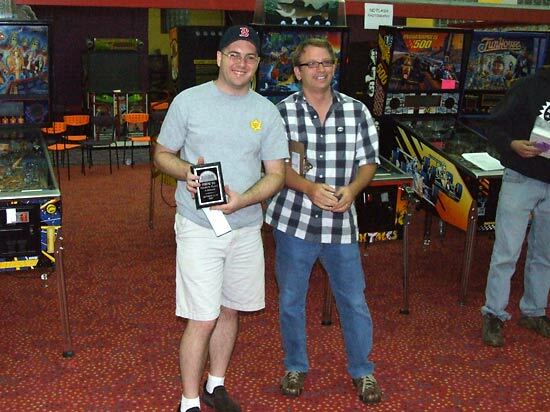 But his lead was soon eroded and then negated as John Reuter went on to win games two and three giving him an unbeatable 9 points and a $750 prize.Timothy's second place finish in the second and third games got him within a point in second and earning him $300. Joel's second and third positions on Embryon and Surf 'N Safari was enough for third place overall and $150, which left Mark in fourth on $50. In the C division the qualifying machines were No Fear, Party Zone, Theatre Of Magic, Sopranos, Guns N Roses, Indiana Jones, Lord Of The Rings, Fish Tales and Family Guy. After all the qualifying entries had been completed around 2pm on Sunday, the top 16 qualifiers moved on to the quarter-finals which began shortly afterwards. 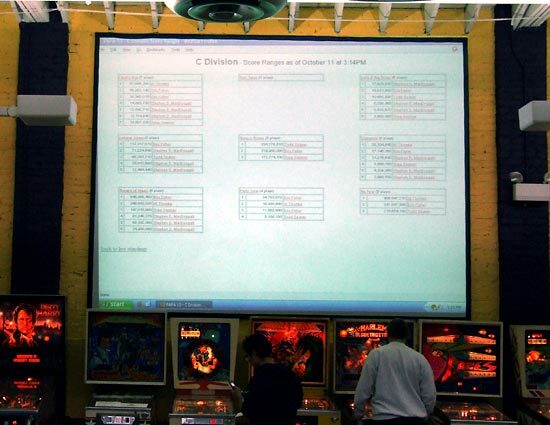 The three divisions were playing simultaneously but after the qualifying round, the machine selections were rearranged with swaps between the A, B and C divisions to make sure players were all playing different machines. After some substitutions for players not present for the next rounds, the C Division quarter-finals began to reduce the 16 qualifiers to 8. The cut was made at 5 points which allowed Madelynne Pursglove, Greg Galanter, Aaron Page, Al Thomka, Johnny Modica, David Plaisted, Kevin Vitale and Dan Gutchess to progress to the semi-final. Both Dan and Al won all three of their matches for a perfect 12 points. Games were played on Spider-Man, The Addams Family, Tommy and Whirlwind. 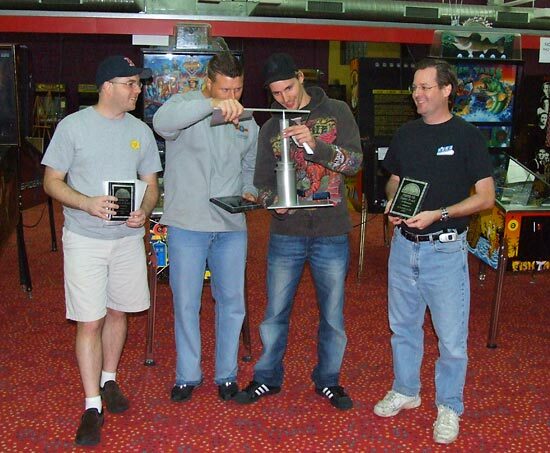 In the semi-finals - played on the same machines - it was Al, David Johnny and Greg who successfully progressed to the final. In the final, an interesting situation developed. The machines used were The Addams Family, Tommy and Spider-Man but after the three games had been played, there was a three-way tie for the top spot between Johnny, Al and David. Another game of Spiderman to decide the outcome saw Johnny's cruise past Al's 95 million score to take first place and a prize of $2,000. Al was second, winning $750. David's 39 million was third to earn him $500 while Greg picked up $250 for his fourth place. In the B Division, the 16 quarter-finalists were reduced to 8 by games played on Cirqus Voltaire, Family Guy, Judge Dredd and Whitewater. The cut was made at 6 points which allowed David Burrier, Derek Fugate, Michael Field, Jory Rabinovitz, Adam Becker, Gabriel DeVine, Adam Lefkoff and Jeff Gagnon to progress to the semi-final. 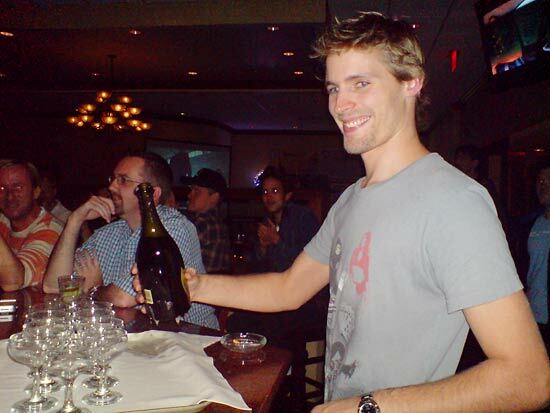 The first semi-final produced finalists Adam Becker and Jeff while the second semi-final added the other Adam (Lefkoff) and Jory to make the final four. The final was played on Cirqus Voltaire, Whitewater and Family Guy. Adam Becker won the first two games meaning only Jory - with two second places - could prevent him winning, but only if he was first and Adam was last. That was not to happen as Adam won the final game too for a clean sweep and maximum points making him the B Division winner and earning him $4,000. Jory was second winning $1,750 with Adam Lefkoff third on $750 and Jeff Gagnon fourth winning $500. And so we come to the top A Division play-offs. For the quarter-finals, the machines selected were Doctor Who, The Simpsons Pinball Party, Twilight Zone, Fish Tales and Lord Of The Rings. For a while, the Doctor Who was unplayable and alternative Doctor Who machines were drafted in from the recreational area as possible swaps or to provide parts as you can see in the picture below. The original 16 players were reduced to 8 who went on to the semi-finals. They were Lyman Sheats, Dave Stewart, John Kosmal, Bowen Kerins, Josh Sharpe, Andrei Massenkoff, Jorian Engelbrektsson and Jim Belsito. In the first semi-final played on Doctor Who, Twilight Zone and Lord Of The Rings, it was Jorian who took an early lead but he was overtaken by John who won the second and third games. Those results were enough to see the two of them progress to the final. 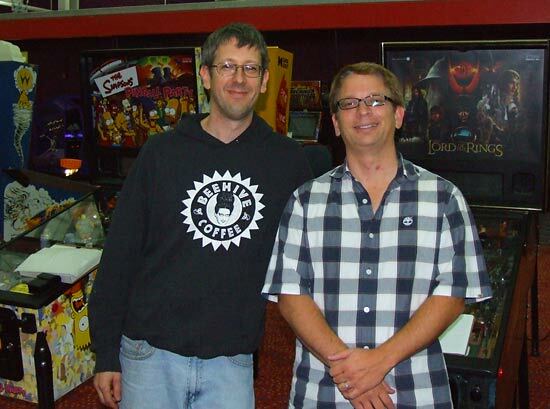 In the second semi-final, Dave won the first game on The Simpsons Pinball Party, Bowen won the second on Doctor Who with a massive 3 billion points while Dave came back to take the third game, seeing both players into the final. 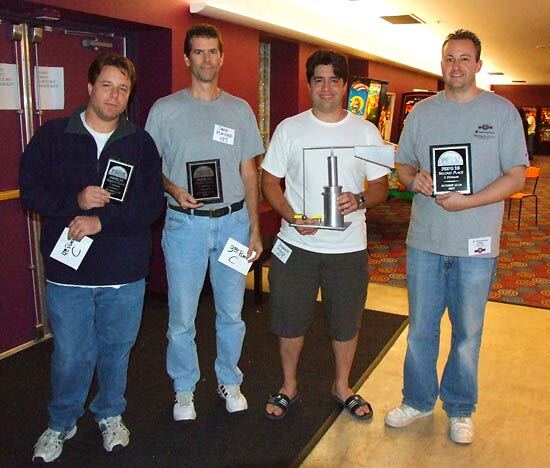 So the final of the A Division consisted of Jorian Engelbrektsson, John Kosmal, Bowen Kerins and Dave Stewart. With Lyman out, we would have a new World Champion this year. 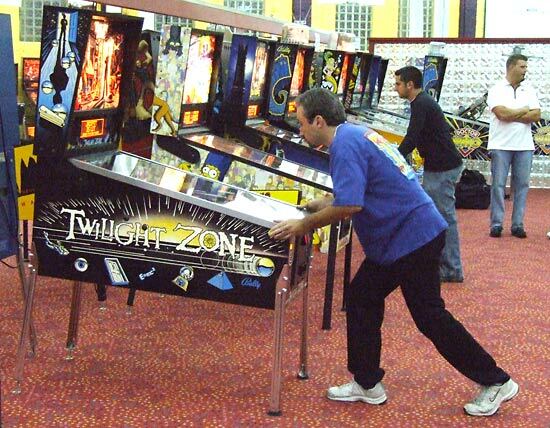 The final four played four-player games on Doctor Who, Twilight Zone and The Simpsons Pinball Party and used the same 4-2-1-0 ranking system to award points. In a change to the pre-assigned cash prizes, the group agreed to reduce the top prize by $750 and increase the 4th place prize by the same amount. That produced prizes of $11,250 for first place, $4,000 for second, $2,000 for third and $1,500 for fourth. In the first game on Doctor Who it was Bowen who started as player one, followed by John, Dave and Jorian was player four. Bowen scored an impressive 1.359 billion points and looked set to take the 4 points ahead of John's 654 million and Dave's 45 million. But Jorian, as the last player in the group raced past Bowen's total, scoring 1.391 billion before he stopped playing as he'd already won. Jorian - 4, Bowen - 2, John - 1 and Dave - 0. The second game was Twilight Zone and the play order the same. Bowen never got a good ball and ended his game on 22.8 million. John did slightly better and scored 82.2 million but the race for the lead was between Dave and Jorian. If Dave could win and take the 4 points, Jorian's 2 points for second would put him on a total of 6 making it possible for Dave or Bowen to catch him in the final game. All those thoughts disappeared though when Dave finished on 125.1 million - below Jorian's 2nd ball score and giving Jorian the 4 points and an unassailable 8 points total against the other players who were all on 2 points. So 25 year-old professional poker player Jorian Engelbrektsson from Stockholm was the winner of the A Division and the new World Champion. Although the title was decided, Jorian finished his game on Twilight Zone with a total of 181.6 million and there was still another game to play to decide 2nd, 3rd and 4th places. With John, Dave and Bowen all on 2 points, the outcome of the Simpson Pinball Party game would settle those places. The final game was a much closer affair with just over 3 million separating first from last. The play order remained the same so Bowen went first and racked up 14.4 million. John was next raising the target to 16.4 million. Dave came tantalisingly close but couldn't quite beat it, ending on 16.3 million but Jorian, in true champion's style, beat all three with 17.8 million to make it a clean sweep and a maximum 12 points. So the final places were: 1st - Jorian Engelbrektsson, 2nd - John Kosmal, 3rd - Dave Stewart and 4th - Bowen Kerins. Congratulation to all four of them for making such an exciting final. Shortly after the final game there was an awards ceremony for the top places in each division. Because it was 9:30pm by the time the ceremony started, several of the winners had already collected their trophies or awards and left for the long journey home. But the A Division players were there to collect their awards. 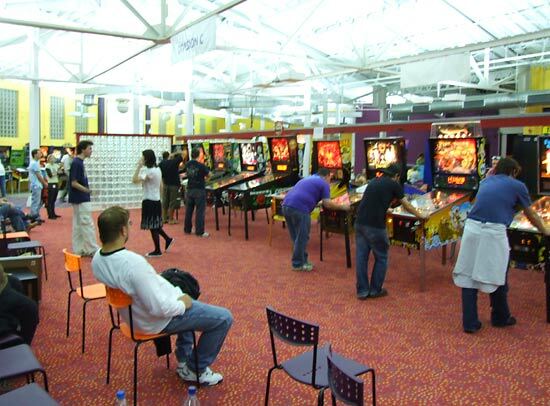 Aside from the main divisions, there were also several mini-tournaments held on machines next to the registration desk. Each entry cost $5 and there was a prize of $100 for each tournament winner or group. To make the tournaments more accessible, there was an Experts Division and a Novice Division. In the Bulls Eye Blind Tournament, the DMD was covered up and players had to get as close to a target score before declaring their score and ending the game. The actual score was then revealed. The tournament was played on Terminator 3 and the target was 77 million. The Triples Challenge Tournament involved three players each playing one ball of a game and the highest scoring team being the winner. The games were play on Tales Of The Arabian Nights. The Mystery Mode Tournament used a modified Twilight Zone machine. It has been modified in an unspecified way which only became obvious once the play began. The highest score took the prize. For the Single Handed Challenge Tournament players were only allowed to use one hand to play the game and no other body parts. It took place on a Monster Bash. Players were up against the clock in the Tense Two-Minute Drill Tournament with 120 seconds to score as many points as possible on a World Cup Soccer machine. 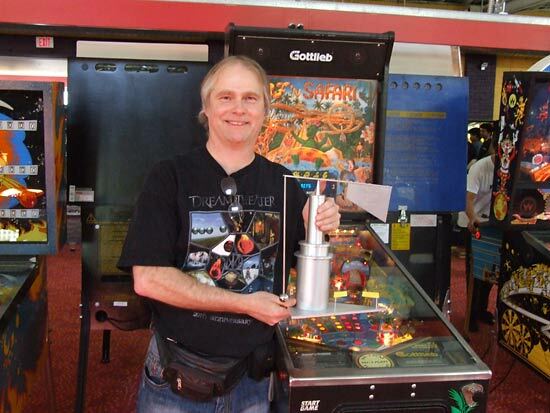 Tommy Mode required the use of extra-sensory skill as the flipper area of a Revenge From Mars machine was covered, denying the player the chance to see the ball or the flippers. The One Ball Challenge Tournament on a Kiss machine is self-explanatory. Highest score takes the cash prize. Finally, the Doubles Spilt-Flipper Tournament has two players playing a No Good Gofers simultaneously - one on the left flipper, one on the right flippers. And so PAPA 10 came to an end and for the Swedish contingent, the celebrations could begin back at the hotel. Putting on an event like PAPA involves not only huge amounts of preparation but also plenty of hard work by many people over the four days to register the players, keep scores in all the divisions, fix machines when they break and feed the masses. Everyone should make the trip to PAPA if at all possible. 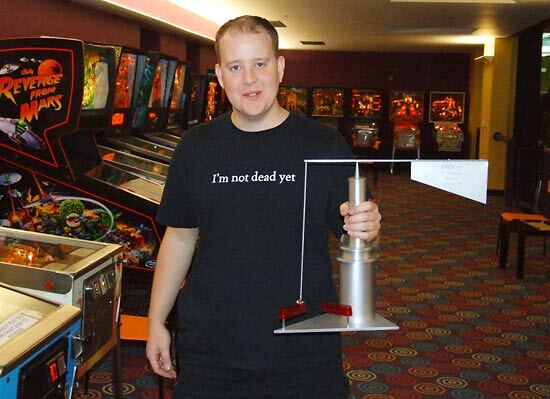 If you're a competitive player, this is the big one - the World Championships of pinball. Even if you're not interested in competing, where else can you find an arcade with over 300 machines set up to play for only 50 cents each? Next year, PAPA returns to it's regular August slot. It will be held August 14th to 17th in the same Scott Township facility on the outskirts of Pittsburgh. See the Diary page for full details and start planning now. Finally, a huge thanks to Ron Shuster for his generous hospitality on Saturday night. Ron owns a fantastic collection machines about 40 minutes drive west of PAPA. 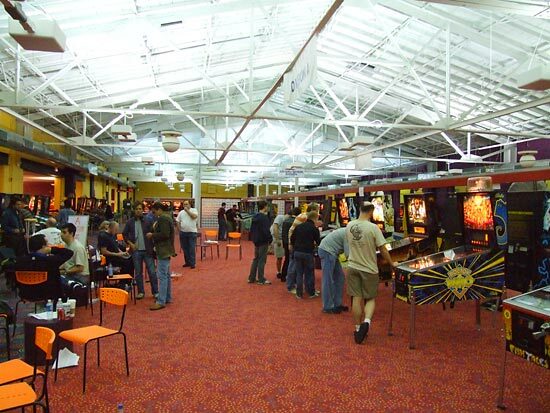 It was described as a Disneyland of pinball and the description is apt. His building, which he built himself, is a marvel of ingenuity and creativity as every twist and turn brings you to another themed collection of machines in excellent condition. His sprawling and eccentric home contains over 130 machines including a new Big Bang Bar and an Addams Family Gold among the collection. Pictures cannot do justice to such an amazing building - the home of the Silverball Country Club - but if your are fortunate enough to get the chance, don't miss a visit to Ron's collection. You've read about PAPA 10 but now you can see it for yourself with our exclusive Pinball News Three Minute Tour. Simply click on the play button below and take a walk around the show.